A group of secondary school students who used gaming technology to recreate the Anzac experience in Gallipoli have won the highly coveted ServiceIQ Best Museum Visitor Experience Award 2016. The honour was announced on Wednesday night at the ServiceIQ New Zealand Museum Awards 2016 held at the Aotea Centre in Auckland. 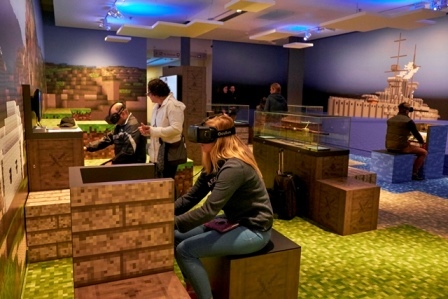 The innovative concept was created when Auckland War Memorial Museum teamed up with student gamers from Auckland’s Alfriston College to recreate, block by block, the Gallipoli Peninsula using Minecraft® gaming technology. Auckland War Memorial Museum – Gallipoli in Minecraft® brought the historical and contemporary together to create an exhibition to mark the 100th anniversary of the Anzac campaign at the Museum. Guided by the Museum’s photographs and collection objects, the students worked with great care and commitment to terraform the actual landscape as it was during the Anzac campaign in 1915. They dug virtual trenches, built battleships, set up camps and supply chains, and fought the Ottomans in re-enactments of the major battles. Through exploring historical sites like Anzac Cove, Cape Helles and Gully Ravine, visitors could experience a soldier’s life in the trenches and grasp the scale of the campaign. Connections could then be made with the photographs, maps and the timeline in the exhibition space. ServiceIQ CEO Dean Minchington says this exciting exhibition gives visitors a fresh new view of a very important part of our nation’s history. ServiceIQ is the Industry Training Organisation (ITO) that provides on job training programmes that lead to advanced skills and national qualifications for talented people working in the museum, tourism, travel and hospitality service sectors among others. Read about the other winners and finalists here.